With respect to babies and motor skill development, there are pros and cons to electronic books. With the rise of electronic tablets such as iPads in both homes and schools, babies and toddlers are increasingly exposed to them. Sometimes a curious infant gets her hands on one in order to examine whatever mom or dad is using, sometimes she is handed the iPad to entertain her, and sometimes mom reads her an e-book on the electronic tablet. The pros and cons of using these devices remain uncertain since they are new inventions and it takes a few years to develop and carry out research studies. It will take a few more years before we know what studies reveal about the use of these “tools” for baby play and children’s learning. With the absence of much research, the next best information sources are the opinions of various professionals who have worked with babies and children in the field of human development. Two recent Wall Street Journal articles, “What Happens When Toddlers Zone Out On An iPad,” and “Once Upon a (Virtual)Time,” attempt to do just that. Written by a father whose own son liked to zone out on his Daddy’s iPad, author Ben Worthen consults experts in neuroscience and child development as well as other parents on the topic of children and electronic tablets. The Pros of iPad use apply primarily to toddlers and children, rather than babies. For example, one obvious benefit with tablets is that touch screen technology remains accessible to young users whose fingers are not large enough to manipulate a mouse or keyboard. For toddlers and young children, some studies show noticeable increase in vocabulary with the use of certain apps. Another benefit for toddlers is that the ipad directs their focus. They are drawn to touch the screen where the action occurs. With a TV set toddlers look away from it about 150 times an hour, according to WSJ, because they do not know where on the screen to focus their eyes and attention. Thus, the iPad may be a better entertainment option than a TV set for toddlers and children. Several parents express the entertainment value of the iPad with their child for long airplane flights or other occasions where they would like to keep the child quiet for long periods of time. Please read our post “TV and Babies” for more information about the effects of television on baby’s development. I’m writing about the Cons of electronic tablet use with the idea that the optimal developmental experience for babies and children includes some exposure to electronics. However, ultimately, encouraging physical and cognitive development is the most important consideration when making choices for baby’s toys and children’s gadgets. Some developmental experts express concerns that the electronic tablets cut short the process of exploration since the app programs have ending points whereas play time with toys such as blocks may continue until the child decides she is finished. The WSJ article suggests that more learning takes place during the reading of board books because of the dialog exchange between parent and baby or toddler. The parent can observe what the baby is interested in and prompt further learning such as, “I see you like the dog. Is she sleeping like our dog sleeps? Where is the dog on this page?”, etc. Here are some additional points for parents to keep in mind. Remember that babies are still developing their eyesight and, with an electronic tablet, the eyes remain focused within the limits of the small screen. Toys and board books encourage more eye movement because the dimensions of the visual playing or reading field are much larger than a tablet screen. Board book skills use more muscles and joints in the body than ebooks which primarily use finger tapping. Books for babies are an integral part of speech development as well. Babies often hear parents read the story and focus on their face and lips rather than the book. They are fascinated with how mommy creates words and closely watch the shapes of her lips and try to imitate them. If the ebook is reading to baby she is not able to observe the process of how speech occurs. For these reasons, Stellar Caterpillar highly recommends that parents include board books in baby’s first library. Electronic toys are plentiful in many nurseries and homes today as babies are drawn to their blinking, flashing, vibrating and beeping. Parents quickly learn that an electronic toy often quiets baby very quickly. However, there are some important developmental points to consider when choosing toys for baby. If you watch a baby use an electronic toy, usually you see a hand move to get to the toy and a then a finger move to push a button. Then the finger continues to move to push more buttons with minor movements of the hand to reach the locations of the buttons. The toy is doing the activity and not the child. 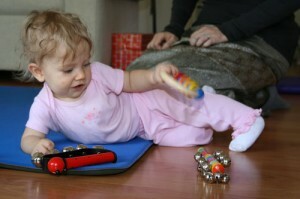 With an “unplugged” toy such as the rattle in the above photo, the baby must vigorously shake her arm to generate the interesting sound. Her entire arm moves as she mobilizes the hand, wrist, elbow, and shoulder joints and all of the related muscles. This develops hand-eye coordination, strengthens her grip, and she improves her balance as she plays with the non-electronic toys in various positions. For example, the baby in the above photo improves her balance tremendously as she shakes the rattle while laying on her side. Can you imagine a baby playing with an electronic toy in this same position? I have yet to see it. Learn to observe the parts of baby’s body moving to play with a toy. When baby plays with a simple rattle she often hits herself in the head with the toy until she learns to coordinate her arm and hand while avoiding hitting herself. This is a skill developed through playing with hand-held developmental toys. Baby holds the rattle and hits herself in the head three, four, or five times and then figures out how to feel her arm move and avoids hitting herself again. Have you seen a baby hold an electronic toy and then hit herself gently while holding it? It is usually too large and too heavy for a baby to hold. Choose toys fostering motor skill development of the entire body and not just the hands and fingers. Recently I saw a baby who played with quite a few electronic toys and she would take her middle finger and push on her Dad’s face. This is what she was learning from playing with the electronic toys. She learned to push a button and then something would happen. Maybe it would happen with Dad’s face as well, she thinks. When baby pushes a button on an electronic toy not only does a light flash, but usually a sound is also generated. This becomes quite intriguing to baby as she learns that she can make sounds by pushing buttons. However, it is useful to keep in mind that the button-pushing and sound-generating activity can become a substitute for baby’s voice. By this I mean that baby feels that she is expressing herself as she pushes the button and hears the “beep.” Often, I encourage parents to remove the battery from the toy and then put their face close to it. When baby pushes the button her mother or father can make the “beep” sound with exaggerated facial and lip movements. Soon baby may imitate mom or dad and make the sound herself. Babies learn to talk through imitation and are motivated by playful games such as this. A wise grandmother, former nursery school teacher, and leader of mommy and me groups for many years suggests reserving electronic toys for special occasions. “When you go to visit another family, then you can take the electronic toy out and they can be very quiet while they are playing with it.” Or when they are very fussy and nothing else seems to quiet them, then you can bring out the magic toy that shines and spins and soothes her anxious soul. By holding these toys for special occasions they possible entertain the baby for an extended period of time, as well.